My work stems from a very deeply personal and sacred space. I am a feminist artist making work that is trying to be in dialogue with the historical narrative of artists I admire, like Lee Bontecou, Anne Truitt, Eva Hesse, Valie Export and the list goes on. When working in my studio I often remind myself how courageous it is to make art. I think making art can be an anarchic act. For this project I chose two locations that I responded to because of their architectural and formal qualities. I place the same sculpture in these two locations, both sites activating it differently. The final sites for this sculpture is a place that is beyond the white walls of the gallery or museum. While not explicitly anthropomorphic, many of my sculptures have a dystopian "presence," while providing witty commentary on the history of sculpture and its obsession with the female form. I use architecture within my sculptures and site-specific installations, to create three-dimensional drawings, using the dimensions of the exhibition space as a frame. I also directly insert myself into my photographs, where quite often the impetus for the photograph is some sort of landmark or architectural feature I am responding to. So as one might gather, place and location is very important in my work. The first photo is of my sculpture in the Historic Centre of Cordoba or also known as the Mosque-Cathedral of Cordoba, a Roman Catholic cathedral and former mosque situated in the Andalusian city of Córdoba, Spain. The cathedral/ mosque has undergone many power shifts between Muslims and Christians throughout the years. Its beautiful arches, materials, and colors can be admired by both the religious and nonreligious alike. 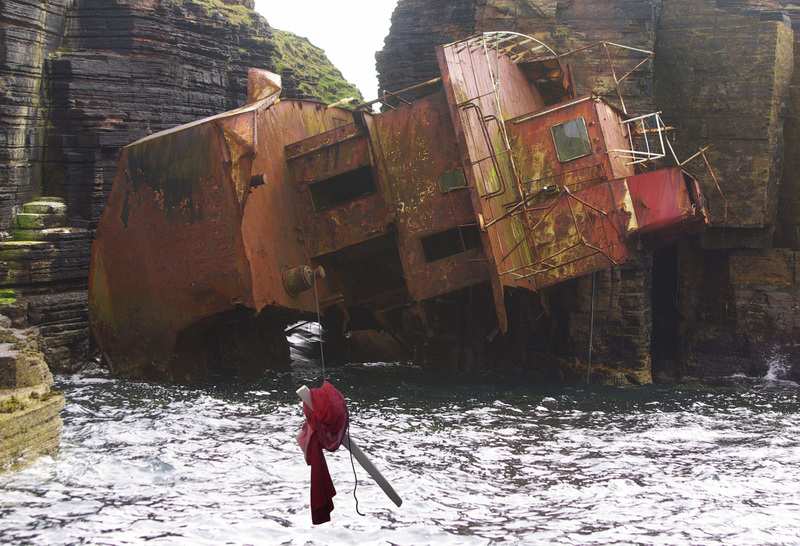 The second photo is of the same sculpture off Stroma Island in Scotland. With these two very different locations I wanted to access places of beauty both man-made and natural, places that carried history within their structure(s) or form(s), places that could provide a setting for deep contemplation; but most of all places outside of the traditional art space. This piece, made of hydrocal and a red satin dress, is about romanticism, form, and grace in the most economical of terms. The mosque/cathedral has a grace and beauty that has endured for centuries, despite much political upheaval. In the same way the Scottish landscape with an old shipwreck is rough and hard; beautiful in its ruggedness while still conveying something deeply poetic. Patricia Burns is a graduate from Claremont Graduate University with an MFA in Studio Art in 2013 and a BFA in Studio Art from Chapman University with an emphasis in drawing and sculpture in 2009. She lives and works in Los Angeles and has exhibited in Los Angeles, CA, Las Vegas, NV, and Sweden.